Peach is a really great dog and was found on a cold, rainy night the day before Christmas. She is the sweetest dog and very friendly and NEEDS A GREAT HOME! She currently resides with 2 dogs and 3 cats. She is current on shots, heart worm negative and spayed. She loves to stay in a crate and resides their at night and during the day. She is great on a leash and loves to be walked. She is house trained and likes to play with the neighborhood kids. She is very much a teddy bear and loves to have her tummy scratched. She is 6 months old and is black with white on her chest. She is being treated for a skin infection right now and is doing well her hair is growing back nicely and will grow back completely. Contact us for more information about adopting Peach. Smokey the bandit might just steal your heart. 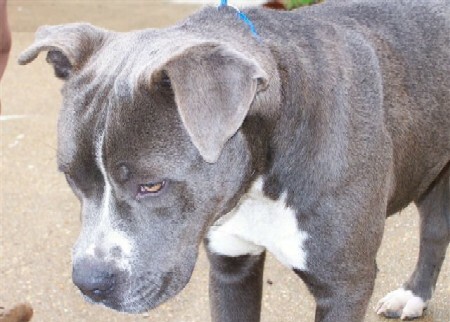 Who wouldn't love this charming blue pit bull boy? He is approx. 18 mos. old and is getting neutered this week. He was found wandering around town. No one claimed him from the animal shelter. So, now he's available for adoption from the Good Shepherd Animal Shelter in Eureka Springs. He has beautiful conformation and a great disposition--loves everyone. He even seems to be getting along well with other dogs. To find out more about what a great family pet Smokey will be, contact Linda at Good Shepherd 479-253-9188. 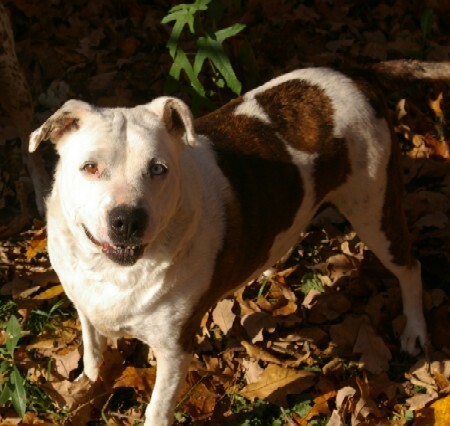 Macy was rescued by a good samaritan who learned that her owner planned to dump Macy along with her buddy, Juna, a Catahoula Leopard Dog. Macy's rescuer convinced the owner to give her both dogs instead of dumping them and now they both need a home though not necessarily together. 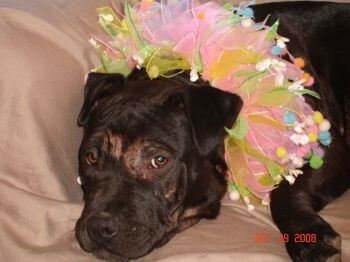 Macy is an Amstaff mix. She's approx. 3 years old, spayed and loves to give kisses. She has one brown eye and one blue. Macy is deaf. To learn more about caring for a deaf dog, visit this excellent site. Juna (the leopard dog) is about the same age and also spayed. If you would like more info on either Macy (pictured) or Juna, I will put you in touch with their rescuer--just use this contact form. Noodles is a handsome pit bull/lab mix. He's about 7 mos. old and has lots of puppy energy. He loves people and other dogs as well. 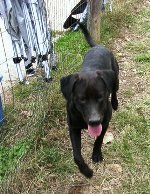 He would do well with family who is active and will enjoy playing with him. He's just waiting to be your new best friend. For more information, email us. Want to find a pit bull in your neck of the woods? Try this nationwide adoption network, Pit Bull Rescue Central. 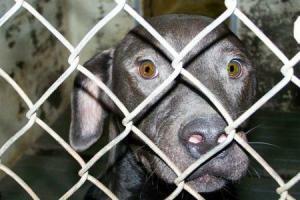 Why Adopt a Rescue or Shelter Dog? Information on this page is deemed reliable, but accuracy cannot be guaranteed.